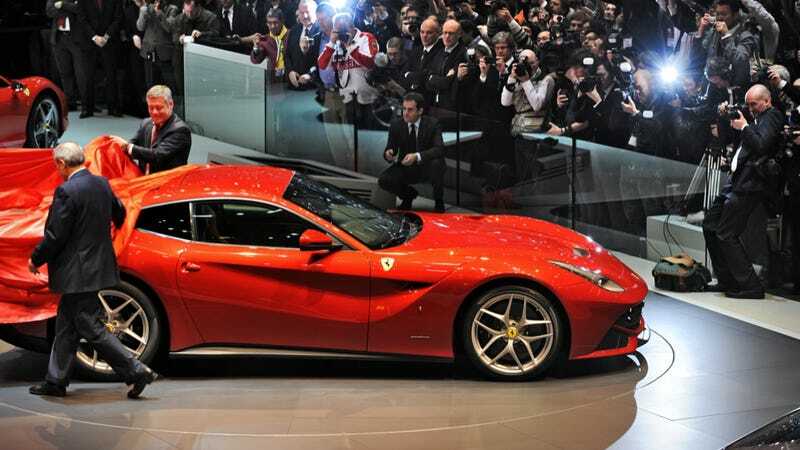 The sheet's been lifted off the Ferrari F12 Berlinetta today at the Geneva Motor Show. Behold the most powerful Ferrari road car of all time. Gaze upon its 730 HP glory. Like all Ferraris, you're buying an engine with some car wrapped around it. The front-mounted 6.3-liter V12 is a worthwhile investment; it is the first of a new family of V12 engines for Ferrari that will go on to power the replacement for the Enzo, as well as the dreams of car-obsessed kids all over the world. Ferrari claims it will go from 0 to 60 miles per hour in 3.1 seconds, and if Ferrari's claims are true (is that even a possibility? ), then the F12 should be able to do better than that with its special Press Performance Package. Maybe even in the 2.9 second range. Forgoing the brand's classic open-gated manuals for a new tradition of high technology, the F12 gets a seven-speed dual-clutch transmission with only 509 lb-ft of torque to contend with. It also has a ridiculously high trunk opening through the rear hatch. Yes, we are nitpicking at this point. It's hard to wrap your head around something so expensive, so imposing, and so damn fast. The F12 is not built principally from carbon fiber, which is where car design is headed, but at 3,362 pounds it has a much lighter aluminum space-frame construction than the old 599. Compared to the 599, the F12 is also lower, narrower, and shorter. We expect that when you put your foot to the floor, it will rip your face off.